I love a good supernatural action adventure, so when I was browsing Netgalley and saw The Beast of Nightfall Lodge by S.A. Sidor was described as just that, I jumped on the chance to request it (thank you to them and the publisher for the copy!). I didn't actually know that this was the second book in a series, so I picked up the first from my local library, and honestly, both were pretty meh. 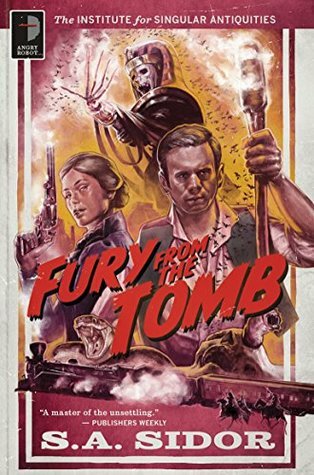 The first book in this series is called Fury From the Tomb. This was described as being a bit like if Indiana Jones met The Mummy, so I figured it would be right up my alley. I was wrong. The story follows Egyptologist, Dr. Rom Hardy, as he unearths the find of his life: a tomb filled with five coffins and a mysteriously large sarcophagus. Here's where everything goes downhill. After the discovery, all of his men die, and Rom is sent back to America to deliver his undead cargo to his reclusive benefactor in Los Angeles. While traveling, Rom's train gets hijacked by banditos in the Arizona desert who flee across the border with his bounty. Rom has no choice by to team up with his sponsor's rebellious daughter, Evangeline, an orphaned Chinese busboy, Yong Wu, and a gun-slinging bounty hunter named McTroy, to track down the mummies before it's too late. I found this extremely slow to get through. You would think with all the action right from the get go that it would be something you would fly through, but it was the opposite for me. I also found the way the story is set up to be a little boring; it's basically Rom telling us about the events years after they happened, so you get little passages from the present before jumping back to the past. I think because I found Rom to be a bit of a bore and very long winded, it made reading his lengthy passages not very appealing. I also had a slight issue with all the supernatural elements in the book. Besides the mummies, Rom and crew go up against ghouls, vampires, and giant worms, but no one bats an eye at anything. It's like everyone just thinks it's totally normal. Honestly, I thought I would like this so much, but I ended up skimming the last 100 pages or so because I just wanted it over with. 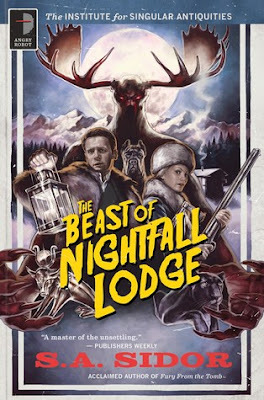 Which leads me to the second book, The Beast of Nightfall Lodge. Like the first book, this is Rom retelling events that had happened years prior. In this adventure, Rom receives a letter from McTroy and finds himself thrust into a mystery of a blood thirsty creature that's prowling through the mountains of New Mexico. A big game hunter who lives on the mountains has promised a huge reward for whoever can capture the beast, so of course headstrong Evangeline has signed the gang up. What follows is a wild adventure through the snow fighting everything from mad doctors to wild animals and a monster so terrifying it's not of this world. I was a bit hesitant to jump into this after not really loving the first, but I was pleasantly surprised by it. I definitely found it faster than FFtT, but it still had its moments where it dragged a bit. Again, no one thinks twice about the supernatural elements, which I just find strange. I did think some of the new characters were interesting, especially the twins, but my favorite was Orcus the talking dog. I thought he was adorable. Some of the plot points were a little predictable, especially in regards to the twins. The ending was very sad, but I liked it. It had everything come full circle. Even though I didn't fully love it, I did think this one was better than the first. I'm not sure if maybe I just went into these books with higher expectations but I was expecting a rough and tough charming leader like Indiana Jones, but that just wasn't the case. Rom has his moments, but for the most part, he's just so boring. I'm not sure if seeing things from a third POV rather than Rom's would've made the stories any better, but it probably would've quickened things up a bit. I found both books to be very pulpy and very much those typical action adventure books you would find during the late 1800s-early 1900s, so they nailed it on that respect, but they just weren't for me.